Have you ever been angry? Or what about critical, or maybe a little bit competitive? Have you ever had a fever, or an infection, or just gotten a little hot under the collar in love, lust, or the throes of something you're really passionate about? Well if you have, and I'm guessing you have, then you've experienced the power of Pitta. According to Ayurveda, pitta is one of the three biological energies or doshas (the others are kapha and vata) that interact to differentiate, organize, and activate basically...everything! In Ayurveda, everything has its own doshic signature: a unique combination of vata, pitta, and kapha that defines how it looks and acts—which can be a strange concept until you consider that there is energy in everything (in fact everything IS energy)! Pitta is the energy of heat and transformation. It looks and functions like a combo of fire and water. Pitta drives all the metabolic processes occurring both inside and outside of us. Our ability to “digest” the things that we come into contact with (food, ideas, emotions, information) is affected by the degree to which our pitta is sufficient and balanced. We all need pitta to keep the “wheels turning,” so to speak. But the level of pitta needed by each of us is completely unique (you might need or have more pitta than me in order to stay balanced). Our pitta energy increases inside and out when the temperature rises, like in summer, or during the hottest part of any day. It also rises when we have spicy foods, hot drinks, get angry, or have contact with the things we're passionate about. But if your pitta blows its top, and you get more heat than you can handle, that's when the fireworks start to fly! Imbalanced pitta, or an overload of heat in the body and mind, can show up in your mind and body in dozens of ways: infections, rage, acne, heartburn, acidity, hot flashes, ulcers, inflammation, diarrhea, aggression, and even an overactive ego. These are some of the signs that your pitta has become a little, or a lot, imbalanced. The great news is that we have all kinds of tools to rebalance and bring pitta levels down to workable levels. These include cooling food, herbs, meditation, and yes...yoga. Why not practice a little “pitta yoga” when things start to heat up, or to keep your fire comfortably controlled? Pitta yoga includes asana, meditation, and breathing exercises that are focused on calming the intensity and heat of pitta in the body and mind. Reducing pitta is all about cooling, calming, and releasing strain or tension. Yoga poses that help reduce pitta are ones that create a sense of calm and openness in the body and mind, like forward bends, seated poses, and poses that allow you to expand and open up without struggling. If your primary dosha is pitta, consider adding these poses to your regular practice. Primary pitta dosha folks are more prone to imbalances of pitta, but anyone who's experiencing an increase of heat, stress, tension, or any of the issues mentioned earlier will benefit from a pitta practice. Each pose should be practiced with the intention of creating calm and releasing tension. 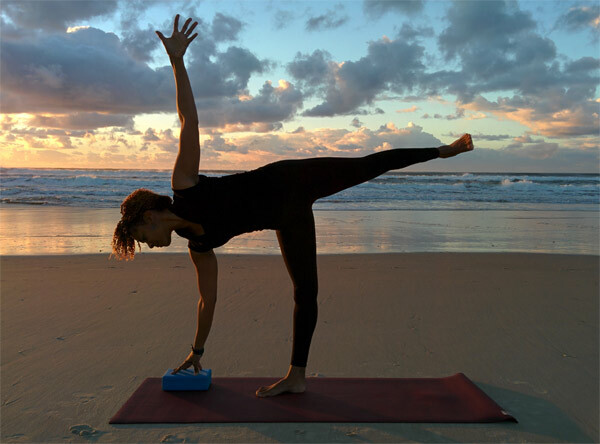 Slow it down and try holding poses for a moderate period of time (4 to 6 breaths), practice without strain, and focus on expansion and release. Ujjayi breath is fine (even though it's heating) as it helps to keep you focused and calm, but keep it light! Paschimottanasana grounds you and allow you to release tension and heat through the legs, feet, and head. How to do it: Feel down through your sit-bones and the backs of your knees (bend the knees if you need to release tension in the hamstrings). Press out through your heels and draw the shoulders down the back. Don't worry about touching your toes; let go of any impulse to overexert or push yourself to your limits. 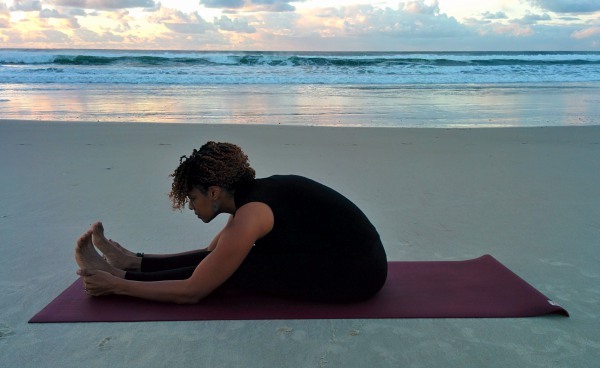 Allow the pose to wash over you like a cool, calming ocean wave as you breathe. Hang out for 5 to 10 breaths. This is my own special flavor of Low Lunge that really focuses on releasing energy downward. How to do it: Enter Low Lunge and take the hands to the floor or a block inside of front foot. Soften the shoulders down, press the top of the back foot lightly into the earth, and drop your chin to the chest. You'll feel release in the psoas...that's okay, just don't push it! Stay here for 4 to 10 breaths. This is your chance to expand and stretch out. The idea is to feel expansive by keeping both legs active (buoyant, not constricted). How to do it:Enter Half-Moon with one or both hands on a block. If you put both hands down, make sure to open the hip of the lifted leg up toward the sky without straining the lower back. Focus your energy on extending through the lifted leg and foot. A pose that directs energy downward, Prasarita Paddottanasana requires that you keep the legs active and the navel drawing in and up. How to do it: Place your hands on the floor or block. If your head reaches the floor comfortably, so be it. If not, you can place your head on a block, or just let it hang. Relax your neck and focus on calming and release. Hang out here for up to 10 breaths if it's comfortable for you. Take it slow coming back up, making sure to leave all your tension on the mat. This Bridge variation is a pitta pleaser. You can also do it supported using a block under the sacrum or unsupported (as pictured). How to do it: Take Bridge as you would normally (feet hip-width apart, feel through the entire surface of the sole of the feet), but keep shoulders level on the floor. Bend the elbows and press the triceps down lightly into the floor. Broaden across the collarbones, lifting the chin slightly. Engage the belly (navel in and up) and soften the glutes a little, but not so much that you feel it in the lower back. Focus on cooling, calming, and relaxing here for 4 to 6 breaths, then lower down slowly. You can take Bridge a few times before moving on. Any of these poses is a terrific “timeout” from the heat. You can also string them together for a mini practice that's great for midday, evening, OR any time you need to cool down! So...how does pitta show up in YOUR mind, body, or personality? Are you a hot head, sharp wit, or prone to heartburn or hypertension? Have a think about it and feel free to share in the comments!